Continuing down the regional research trail and found this to be very interesting. Much much more to come in the coming weeks. A couple of notes about the graph. One, February 2008 is chosen as the beginning point since Oregon’s total nonfarm employment peaked that month, while Washington’s peaked in March 2008, just one month later. Two, Portland is defined here as the five county MSA (Clackamas, Columbia, Multnomah, Washington and Yamhill), while Seattle is defined here the three county MSA (King, Pierce and Snohomish). Interesting to note that both of the major metropolitan areas have experienced nearly identical employment cycles over the past four years (even if the exact composition of the changes is somewhat different). These regions are also responsible for the vast majority of the employment gains the past two years. Non-major MSAs and rural areas of both states have yet to fully share in the recovery to date, if at all. 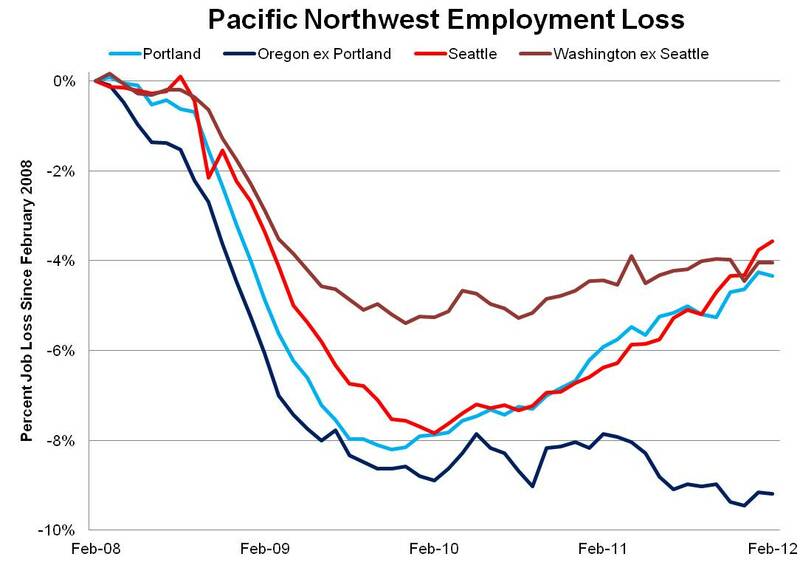 Non-Seattle Washington is doing better that Non-Portland Oregon both during the recession and so far in recovery. There are a number of reasons for this, including Hanford, Housing and Agriculture, to name three. Tri-Cities, Washington (Benton and Franklin counties) is home to the Hanford Site which received approximately $2 billion in additional funding from ARRA, which greatly benefited the local economy by boosting employment and income. The region actually added nearly 10,000 jobs through mid-2011 (+10%), however as the additional funds have more or less been spent at this point, the region is losing jobs today to the tune of 2,400 in the past six months. Two other contributing factors worth noting are housing and agriculture. 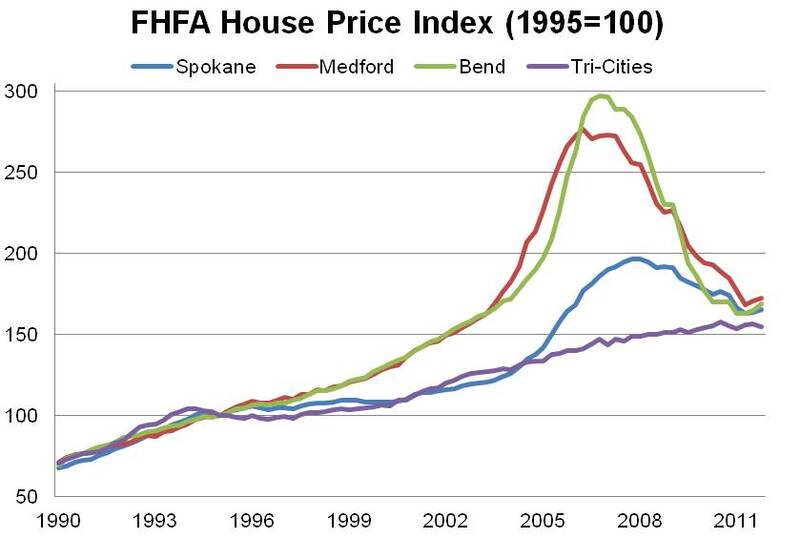 While many regions experienced a housing bubble and bust, Medford and Bend were particularly bad and devastated their local economies. Conversely, mid-sized MSAs in Washington like Spokane and Tri-Cities did not experience housing bubbles of similar magnitude. See graph below. Finally, while commodity prices have generally been high in recent years – supportive of agriculture – it appears based on what crops are grown in which regions that the composition of agriculture is also at play. This is more of a hunch based on the overlap between crop types and employment trends than any industry research I have seen (please pass along any that you know of). The regions more reliant on grains, grass and trees have fared worse than those dominated by fruits (apples in particular). The grass seed farms and nurseries in the Willamette Valley have been hit hard by the recession while Washington enjoyed a record apple crop in 2010 and 2009 and 2011 were good years as well. Summary: The large metropolitan areas of both Oregon and Washington have experienced very similar employment trends so far this business cycle and have captured the vast majority of employment gains these past two years. The rest of the states – outside of Portland and Seattle – have seen different experiences and have yet to fully share in the recovery, if at all. While not a complete list, Hanford, Housing and Agriculture appear to explain some of the differences between these regions.